The commodities swansong is back on the hymn sheet. If we look at the staple commodities that have propelled countries like Australia to the top of the commodity-exporter stakes (coal, iron ore, zinc, gold) — they have all stabilised their swan dives since 2014 and are now creeping back to the forefront of investor attention. The spot price for premium coking coal has now rallied by over 60% since mid-February. 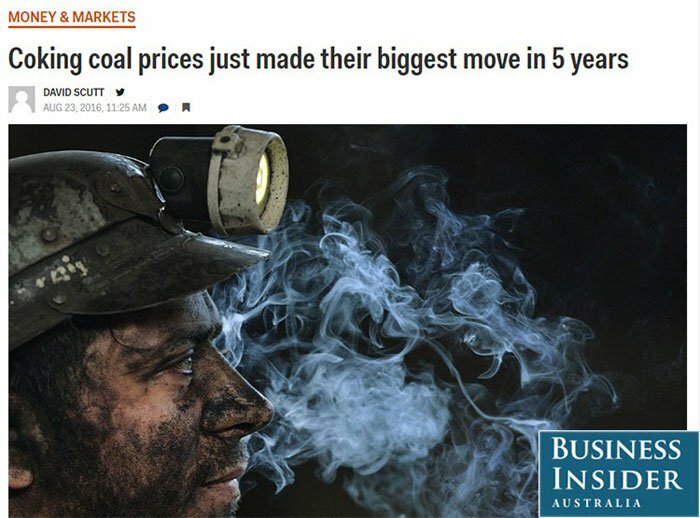 Whilst there is currently some cyclical risk in coal, going by the turnaround in price from $74/tonne to $160/tonne since mid-February, it may only be a matter of time before a smart investment in the space could come home to roost for the patient investor. This is speculative, of course, and commodity prices can fluctuate, so before investing in this sector, it’s always a good idea to seek professional financial advice. Pacific American Coal (ASX:PAK) is the epitome of a streamlined explorer with the bit between its teeth. PAK is looking to progress its flagship Elko Project in Canada, which is known for its high quality coking seams, after snappishly listing on the ASX early last year. Not only has PAK secured an excellent asset in Canada, it has also commissioned a detailed study into the commercial viability of Elko including a 3D model of what its mine site and processing infrastructure could look like. The fact that PAK is already pencilling in its mining infrastructure is significant because it likely means PAK is in Canada for the long-term. PAK’s commitment and presence could attract investment from a variety of sources including current coking coal producers and end users. PAK is structured in such a way that investment could be from farm-in partners, joint-venture offers and maybe even a takeover offer further down the track. When the coking coal price was previously in the doldrums, the PAK Board undertook a bold move to expand the portfolio of the business to pursue technology opportunities. PAK recently completed a 40% acquisition of Imagine Intelligent Materials (Imagine IM), a graphene commercialisation company. This is an adventurous move, but one that the market has valued over the past few months reflected in the rise of PAK’s share price. As you can see PAK is not a one-trick pony. ...and is a 40% stakeholder in Imagine IM — the world’s first graphene commercialisation company that will be manufacturing graphene-based products such as the Imgne X3 — but more on that later. The hope is that PAK’s mining activities at Elko Coking Coal Project can be neatly blended with its downstream graphene revenues, thereby creating a vertically integrated, ‘paddock-to-plate’ carbon company, with relatively plumper margins compared to the gaggle of other graphite contenders that lack the supplementary graphene angle that PAK has. Since our first article on PAK, the company has made an investment into Imagine IM, and you can read about that move in this article . Today’s article will go through in detail what comprises the company’s current valuation, and importantly what may be in store for this stock. Importantly for PAK right now is that coking coal prices are heating up, boosted by another bout of fiscal stimulus in China along with a swathe of supply disruptions worldwide, spurring shortage. Coking coal prices have, in fact hit $160 per tonne, an increase of 219% from their low of US$73 per tonne in November 2015. 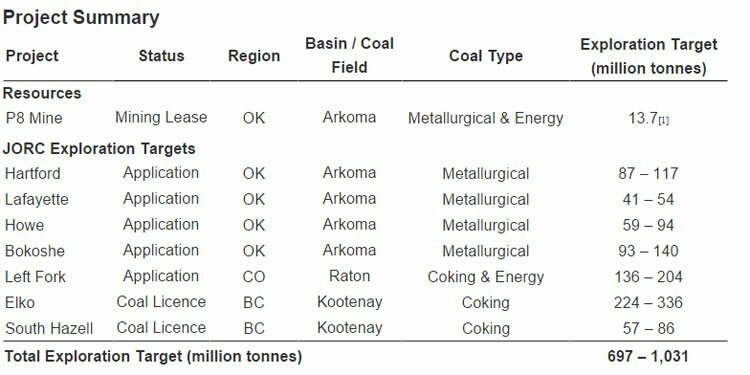 With coal prices back on the uptrend, now could be a great time for PAK to reassert its business case to become one of the first commodity-recovery-early-movers by maximising the progress it can make at its flagship Elko Coal Project in Canada. PAK has been encouraged by the six month spot price for low-volatile premium hard coking coal and believes the recovery of the price supports its decision to progress a project expenditure strategy that targets high value activity. In order to make best progress, PAK decided to commission a detailed 3D model of Elko’s future processing facility as part of concept studies. The modelling is now complete with much of the required equipment and works to be done now identified. 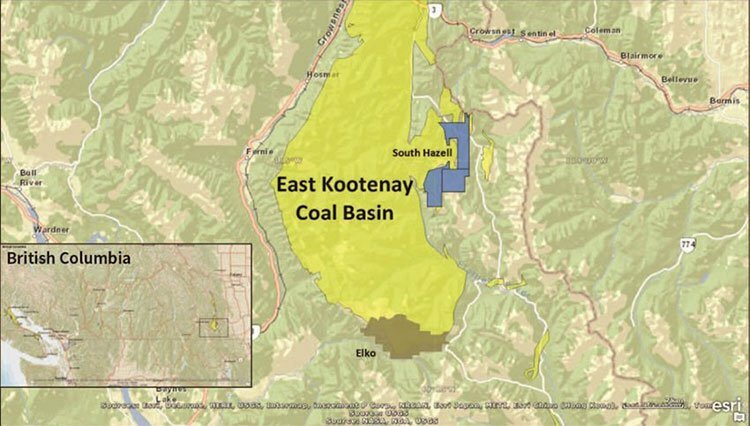 The layout design and 3D modelling was carried out by Hatch Ltd and identifies the major infrastructure and production components required to set up an operation within the Elko Coal license area. Hatch is completing a concept level mine infrastructure and coal processing CAPEX study for Elko, building on the 3D mine site modelling. Hatch will provide capital estimates for the key capital components identified during the 3D mine site modelling package including materials handling system, workshops and mine infrastructure, site infrastructure, coal preparation system, tailings storage system, equipment for the open cut component of the mine and execution phase construction costs. Results of the study are expected within the next two months. The 3D model helps PAK to pick the optimal final location for its mine site, although there are still some aspects of Elko that have yet to be assessed, such as archaeological, anthropological and ethnographic studies to be combined with environmental biodiversity and ecological assessments. To reduce start-up capital requirements, the initial design was to leverage the open cut opportunity at Elko. PAK’s estimated ‘open cut’ resources of 13.5 million tonnes and with a strip ratio of approximately 5 bcm (bank cubic metre) to 1 tonne of coal, means that there is a strong likelihood that PAK will have the sufficient grade combined with the sufficient bulk processing capacity, to make its Elko project successful. 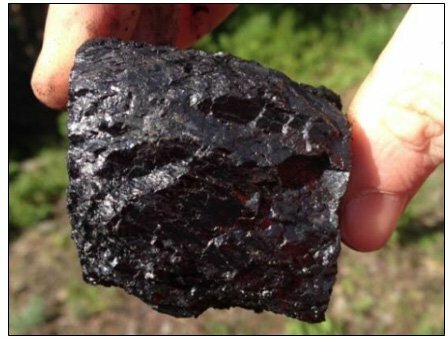 For a detailed assessment of PAK’s Elko Coal Project including comparative coking coal quality to other deposits worldwide, refer to our first article on PAK published in February 2016. When fully operational, Elko has the capacity to underpin a 1-2 million tonne per year operation based on the resource containing an area suitable to a low strip ratio open cut mine. Furthermore, Elko may have its capacity expanded over time as an underground operation is gradually established and brought online. PAK has opted to adopt a capital expenditure schedule over a broader time frame, with underground development expenditure occurring during a period when the operation is in cash flow. This approach will maximise the capital efficiency of the project while minimising risk. PAK’s story has been one of growth linked to the graphene backstory being handled by PAK’s brother-in-arms, Imagine IM, a private company that is commercialising graphene through its application in conductive geotextiles. As Far East Capital analyst Warwick Grigor pointed out in a recent investor note, six months ago the market was valuing PAK at only 1¢ per tonne, whereas a normal market valuation could easily be 10-20¢ pt. Back in March, PAK’s market cap was only $3-4M, but since then the market cap has increased to $15M (after hitting $20M). Most of this increase was due to the acquisition of a 40% stake in Imagine IM. 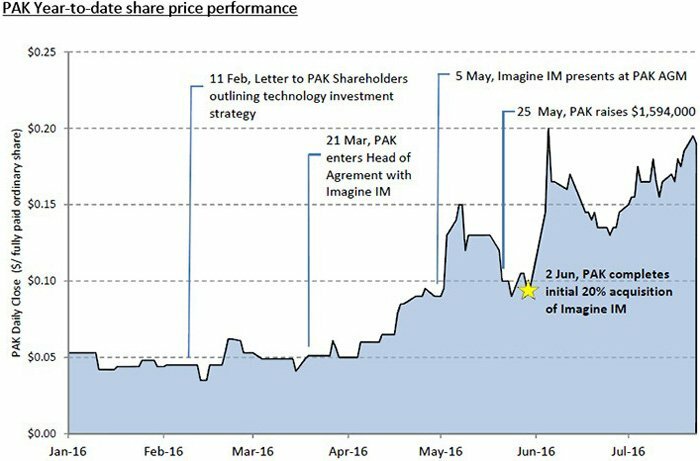 The market is valuing the Imagine IM business at approximately $10M, leaving a valuation of $5M on the coal assets, which is still only 2¢ pt. So it appears there may well be more upside to come. At the same time, trying to establish a fair share price target on a stock is never easy, and based on a host of assumptions which may not eventuate. So it’s always wise to invest with caution, and consider your own personal risk profile before choosing to invest in speculative mining stocks. Imagine IM is targeting the geotextile market initially as an industry that is ideally suited for disruption. Graphene-based leak detection is Imagine IM’s market entry product and will over time create a pull market of up to 10 tonnes of graphene per year from that one product alone. Imagine IM’s Geelong production plant is now functional thereby enabling the first product from the agreement with Geofabrics to be on the market within months. Imagine’s ‘first commercial product’ is ImgneTM X3 — an electrically conductive coating for PET geotextiles that enables efficient and economical leak detection to be realised when building tailings dams and landfills. Integrity of liners is essential in preventing toxic leachate from leaking into groundwater but their current installation is lengthy and costly due to the materials and installation processes required. Imagine IM’s solution reduces materials costs and installation complexity. The tests for the commercial product were conducted by ExcelPlas , a NATA accredited testing facility providing independent validation of Imgne X3. The next step for Imagine IM is to develop imgne X3 formulations for other polymers used to manufacture non-woven geotextiles by customers in other geographic markets and successfully complete similar field trials. It is anticipated that commercial revenue producing agreements with other licensees and customers will be secured during early 2017. Imagine IM will continue to optimisation its manufacturing processes as it also explores developing new market opportunities as part of continuing R&D. Imagine IM is one of a very few companies that is involved in commercialization of the material. This step, requiring functionalization of the graphene, requires actual customers and a deep understanding of the customers’ manufacturing processes. At the end of the day, graphene offers incredible possibilities. Imagine IM is attempting to turn these possibilities into realities. If we add PAK’s graphene intentions, its addressable market potentially becomes infinite. Due to its unique physiochemical characteristics, graphene has wide applications across different industries such as energy, electronics, composite, coatings, biomedical, sensors, automobile, aerospace and electronics. 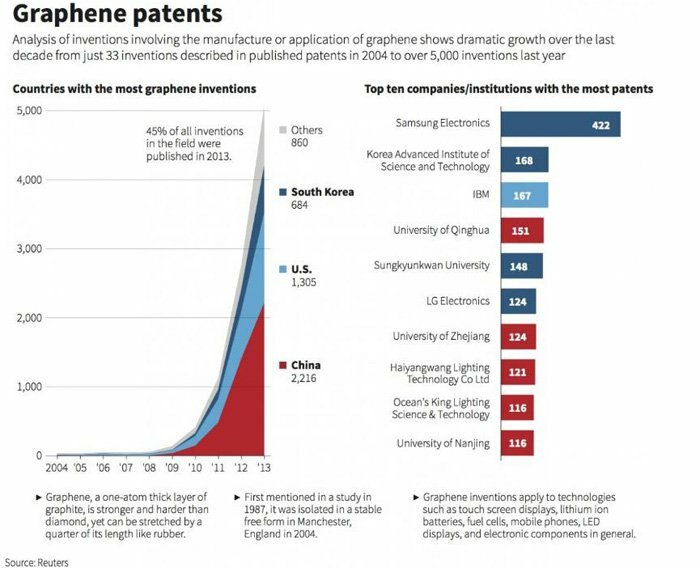 The graphene market is expected to reach US$278 million by 2020 , having been non-existent in 2012. By 2050, it is likely that graphene applications would have been advanced by R&D to the extent that they become widely used around the world and therefore, creating a multi-billion dollar market. Being an early-mover in graphene could be just another lucrative step PAK has made. To keep our readers abreast of the latest sci-fi developments coming out of Tesla — the world’s largest single-source of graphite and lithium demand — check out Tesla’s latest invention: The Tesla Snake. This innovation will allow Tesla electric-car drivers to have their vehicles ‘re-juiced’ by a fully automated robotic metallic arm that locates the charge-point and charges the car autonomously. Upon Tesla making this video public, technology commentators, analysts and car enthusiasts alike were all reportedly swooning into a collective frenzy fuelled by ponderings of potential commercial applications. ...the result is a one-stop shop for an early entry into graphene commercialisation, with a foundation of quality coking coal assets, very much undervalued. Commodity markets have disappointed investors and analysts in recent years, but with raw material demand now starting to find its feet with supply imbalances correcting in tandem — means PAK is in a strong early position to advance its Elko Coking Coal Project into commercialising high-grade coking coal for steelmaking. 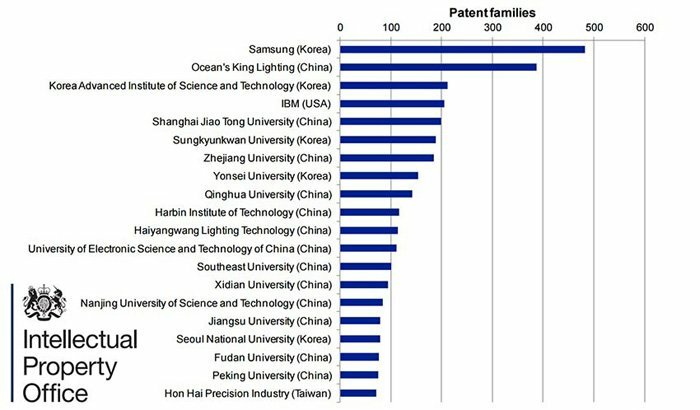 Last but most certainly not least, PAK’s Imagine IM deal opens the door for industrial graphene sales revenues. Now, specific revenue numbers are a little time away for this company, so don’t assume they will eventuate – this is a small company in a new market, with no guarantee of success. If you are considering this stock for your portfolio, seek professional financial advice. In PAK, there is yet another strong small-cap mining candidate packing some very attractive caveats. With everything it needs now in hand, PAK is aiming to punch above its A$16M market cap. PAK Move to Graphene: An Aussie First in Taking this Nano Material from Lab to Industry? Why is this Little Known ASX Company Attracting Attention from Veteran Stock Pickers?